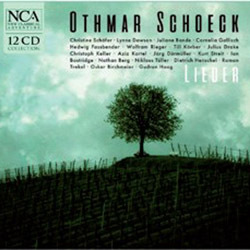 Swiss composer Othmar Schoeck (born 1886 in Brunnen, Switzerland, died 1957 in Zurich) is one of the most important Lied composers of the 20th century. After studying with Hegar, Kemptner, Att enhofer and Max Reger, Schoeck created numerous Operas and Lied compositi ons, enjoying growing popularity and admiration amongst literary giants like James Joyce and Samuel Barber who he inspired to write poetry. Amongst his many supporters, some of the most prominent were Karl Bohm and especially Dietrich Fischer-Dieskau. German writer Hermann Hesse was Schoeck’s friend, as well as violin legend Stefi Geyer to whom he dedicated his Sonata for Violin and piano and his Concerto for Violin and Orchestra which she both debuted. Influenced by Alban Berg and the music of Les Six, Schoeck combined 19th century traditions with elements of early modernism. After World War II, Schoeck’s influence diminished, partly also because he did not further innovate his style and refused twelve tone techniques as well as giving up on tonality and rhythmic structures. It is due to the Swiss publisher Jecklin that the complete Lied cycle of one of the most important Swiss composers of all ti mes have been recorded and published on a number of consecutively issued single CDs, featuring, among others, Christine Schafer, Juliane Banse or Ian Bostridge, some of today’s most prominent vocalists. Long deleted, these recordings are now being made available for the first time in this box set.